These 1 1/4" Engine Guard Bowleg Footpeg Clampsallow you to mount your foot pegs to the engine guard for a more comfortableriding position. 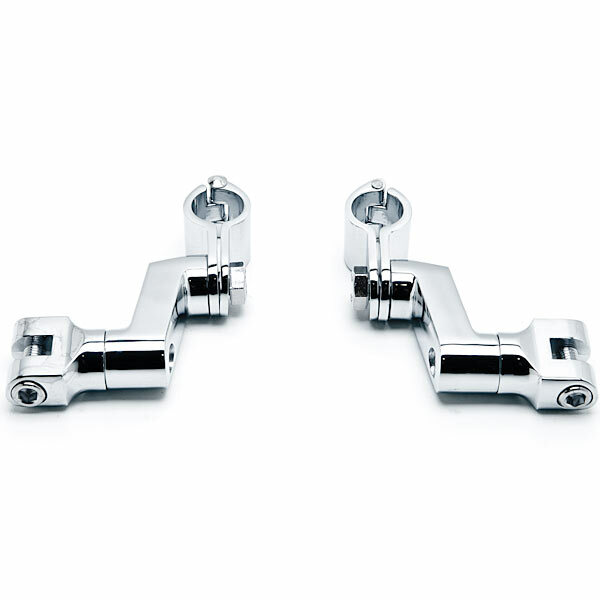 Easy installation of any Harley Davidson or Metric Motorcyclemale mount-style footpegs on to 1 1/4" front engine guards. These Highway pegsmounting bracket allow riders a range of adjustment that is not possible withother clamp-on style highway pegs. The offset can be rotated 360 Degree in a7" diameter circle to accommodate tall ,short ,or average heights riders. Thesecan be installed on any round tubing (frames or engine guards),but it is importantto keep in mind that the footpeg itself will end up perpendicular to the barto which it is mounted.